Jays t-Jays Three hit resounding lows and crisp highs, giving them outstanding value if you can get past the awkward fit. Jays, one of our favorite headphone manufacturers, goes off the unbeaten path with its t-Jays Three earphones, which are designed to offer a wider dynamic range than some of the other earphones in the product lineup. Priced at about $99, the t-Jays Three rest at the top of the t-Jays lineup. 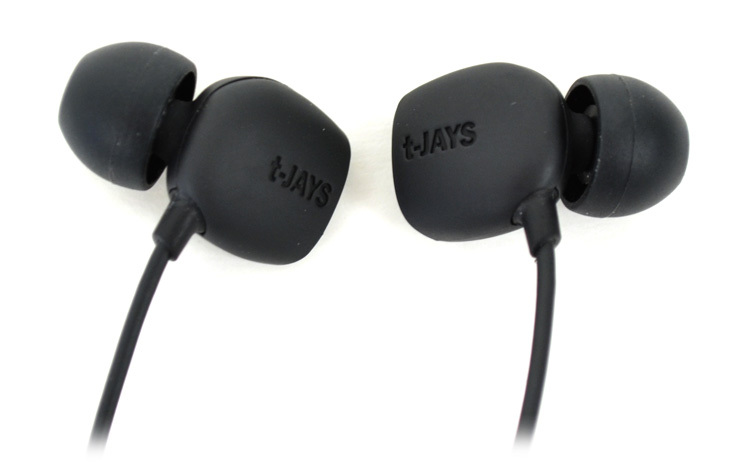 The t-Jays Three earphones differ from the other Jays earphones in a number of ways. The first is the 10 mm driver, which is the largest in the company’s lineup. Sensitivity is rated in the middle of the pack at 98 dB at 1kHz, but the frequency response is lower than the other Jays earphones, rated at 15 Hz to 25,000 Hz rating. 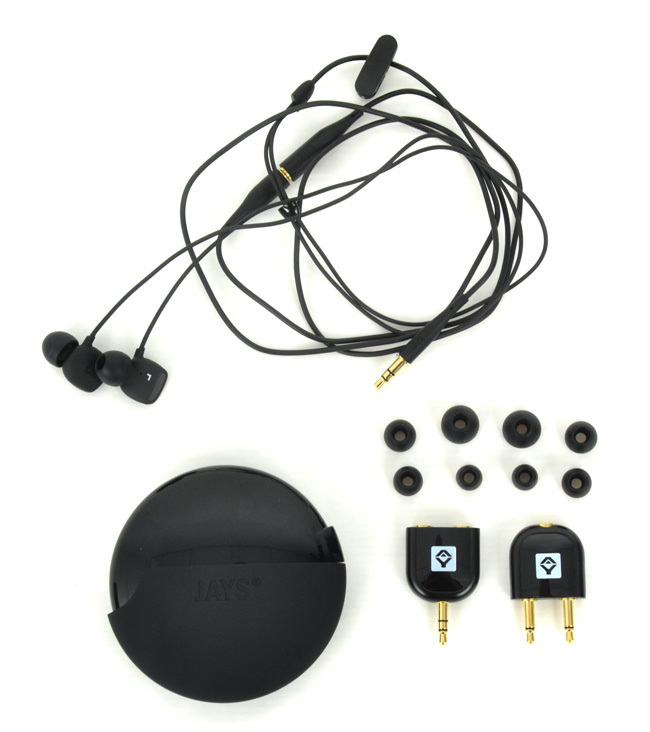 Overall, the t-Jays Three are supposed to produce a wider sound range with deeper bass than the company’s other products. As with all, or most of the Jays earphones currently available, the t-Jays Three come in some pretty impressive product packaging, and with a plethora of accessories that include a 70cm extension cord (plus standard 60cm cord for a total of 130cm), five different-sized silicone ear tips, an airplane adapter, stereo splitter and high quality, hard plastic carrying case. As we have mentioned in previous reviews, the build quality of Jays products is unrivalled, and the t-Jays Three are no exception. For our tests, we used an Apple iPhone, and a 2010 iMac 27-inch PC. Music selection included Issa Bagayogo’s Tassoumakan, Rodrigo y Gabriela’s World, Phoenix’s Amadeus and Black Eyed Peas’ E.N.D. We broke the t-Jays Three in for more than 20 hours before testing. Unlike the a-Jays Three, which we found to be one of the most comfortable earphones to wear, we had a difficult time adjusting to the t-Jays’ awkward design, which requires that you contain the external speaker enclosure in your ear cavity. They curve in such that they are almost flush with your outer ear and ear lobes. While they look great, we found them very difficult to get into place properly, and people with smaller ears might have trouble altogether getting them in. In terms of sound, the t-Jays Three live up to their hype. 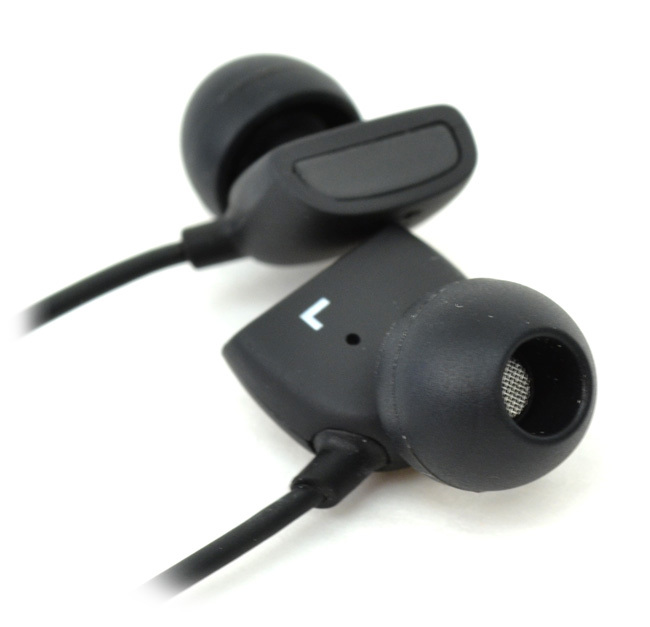 The earphones have a wonderfully dynamic soundstage that is truly surrounding. Highs are present, but not nearly as crisp as some of the other earphones we have tested, particularly those with smaller drivers or micro armatures – but that is to be expected. The midrange is also present, but is more complementary to the highs and lows rather than standing out on its own, which is the way it should be in an earphone like this. And as you can expect, bass is very deep and present, but still relatively tight – just enough looseness to make hip hop fans happy. We also found the t-Jays Three were able to produce extremely deep bass without bottoming out when they needed too. Bass is realistic and not artificial, which we have experienced in some earphones (ex. Monster Beats), this is the way bass should be – naturally produced by a large, high-quality driver. The t-Jays Three are great for people who require a little extra length. We experienced minimal cord feedback while walking, and little to no ear fatigue after prolonged use – just make sure you wear the correct-sized ear sleeve. The t-Jays Three uphold the company’s dedication to sound quality, producing crisp highs, warm midrange and deep, tight bass. The t-Jays include a two-year warranty and a number of accessories, which is quite compelling, but we just can’t get past the awkward design of the earphones themselves as they can prove to be difficult to put in the ears. If you have larger ears, then you should not have too much of a problem with the fit, but we have to ask, why bother? If you can get past the fear of the fit and have a love for a deep, involving soundstage, then we can confidently say these are some of the best earphones available for under $100 in this class.